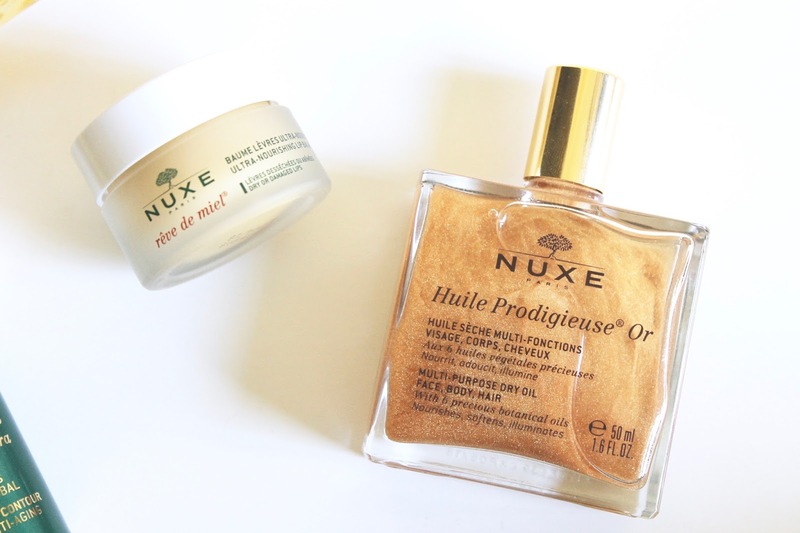 Nuxe Huile Prodigieuse - You know my love for this product is real. It's a wonderful dry oil that smells like heaven, is absorbed quickly, and comes in convenient spray packaging for easy, mess-free application. I've done a full review here, if you'd like a more in-depth rave on this multi-tasking hair, body, and face oil. 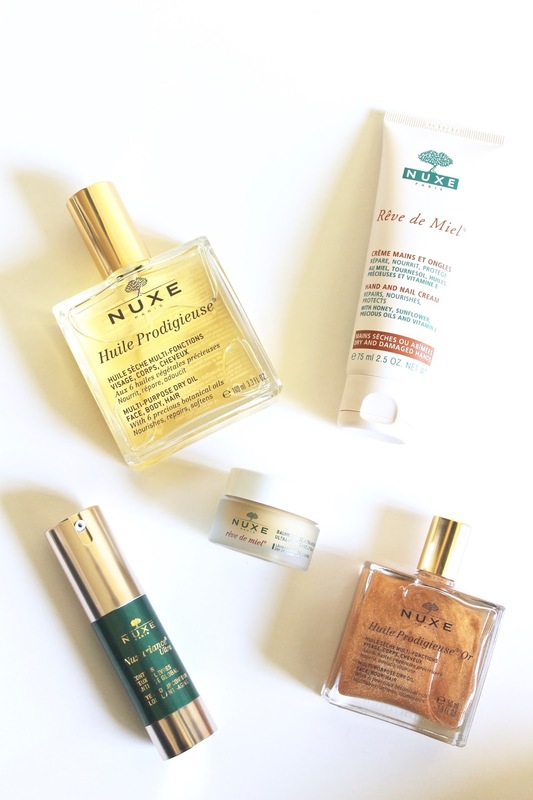 Nuxe Huile Prodigieuse Or - This stuff is like the J. Lo approved version of the original oil that we all love so much. It has the same delicious smell and nourishing, lightweight texture, but it contains tiny golden shimmering mineral particles to amp up the glow factor. If you are headed somewhere special and need to your limbs to look amazing...look no further than this beautiful radiant oil. Nuxe Rêve de Miel Ultra-Nourishing Lip Balm - This is another longtime love of mine, and is truly unlike any other lip balm on the market. The thick, almost gritty, balm smells of orange and honey and contains a hefty dose of Vitamin E and Honey to nourish and plump the lips. It is one of the most effective treatments for chapped lips, in my opinion, and I even love leaving it on my lips overnight so that it sinks in as I sleep. I'm always so surprised to find it still there in the morning and my lips feeling plumped and silky smooth. Nuxe Nuxuriance Anti-Aging Eye and Lip Contour - This lightweight, yet nourishing cream does double duty at counteracting the effects of aging on both eyes and lips. It contains Saffron and Bougainvillea to help prevent wrinkles, tighten the skin, lighten dark spots, and of course depuff and brighten. I am obsessed with this little multi-tasking gem and even notice the lines around my lips appear much smoother and more taught in addition to the skin around my eyes. Double duty products that work wonders like this one are must-haves in our busy lives!